Some people have reported noise when using VHF wireless microphones with the TRV900. I had a quick look at the noise generated by the TRV900 camera itself, using a RF spectrum analyser (HP ESA-L1500A) which has a frequency range from 9 kHz to 1.5 GHz. In this test I had it tuned to a segment of the VHF frequency band from 175 to 275 MHz. I used as an antenna a circular loop of wire about 5 inches in diameter, which was actually wrapped around the TRV900. I measured the top spectrum when the camera was off and the bottom one when it was on and recording video, using the same analyser settings. 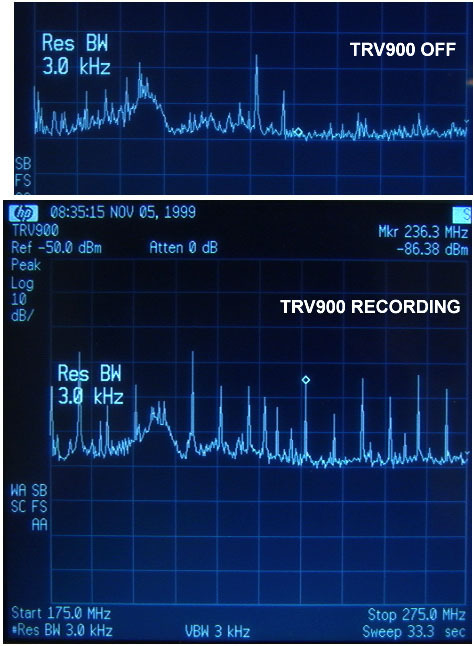 As you can see the TRV900 generates a "comb" spectrum superimposed on the background RF environment (noise from VHF television, pagers etc.) I think the TRV900 signals are harmonics of a digital clock frequency in the camera of about 8 MHz. The spectrum falls away quite rapidly as you move the antenna away from the camera, falling to the background level only a few feet away. If one of these frequency spikes fall into your VHF receiver passband, and your antenna is within a few feet of the TRV900, it will probably interfere with your reception.VHF noise can also be conducted along the microphone cable connecting the receiver to the TRV900. Don't forget that interference works both ways. A cell phone, for instance, is a UHF radio transmitter and if you have one in your pocket and recieve a call, it can interfere with your recording. At least two people have reported picking up their cell phone on the TRV900 audio. The solution to this one is to turn your cell phone off when shooting. Back to the TRV900 page.